Spend an experience-building semester in Chicago. Our 16-week semester program delivers a custom-tailored Chicago experience designed to help you prepare for your chosen career – and life after college. We work closely and collaboratively with you to place you in a full-time internship that matches your interests. Plus, you’ll take a professional seminar and up to two courses for academic credit, depending on the track you select. Nearly 80% of 2017-18 CS students were offered references from their supervisor for future positions. 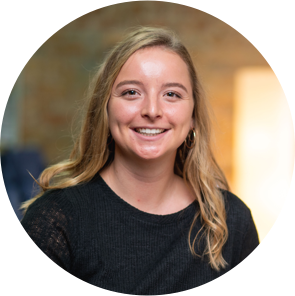 Whether you want to learn more about internships or anything else, from courses and the application process to housing and life in Chicago, Sara is here to help! "The value of having an internship downtown Chicago is that you see and experience so much more than if you were in the suburbs or small town where your college is located. The needs here are vast, the stories and experiences have more variety, and everything moves at a fast pace. Working in a setting for four days a week is basically as if you were full time, giving you a well-rounded experience. The classes allow for reflection and learning about the city, and the internship gives you insight into a place that you might or might not want to work someday. Chicago Semester is filled with resources, and the value of having them at your fingertips to learn from is great. I have learned not only about the field of social work this semester, but also myself and my values."